Converting an area of your basement to accommodate guests takes very little work if you have the right furniture. With modular (or rearrangeable) furniture, you can modify how basement furniture is used without changing the furniture itself. Take a look at the many designs that now exist for multipurpose furniture, the options are endless! You’ll want to make sure and choose items that are easy to move yet durable. One of the best-known types of rearrangeable furniture is the rearrangeable sectional sofa. You and your family might arrange your sectional sofa pieces in a semicircle so that family members can enjoy watching television or a home movie together. Another idea is to separate the sections into two parts that serve as an area divider. Face a chair or two towards the children’s play area, and use the remaining sections to create comfortable seating where the adults can relax, play a card game, or watch TV. When hosting guests, rearrange the sectional so that everyone comfortably faces each other while visiting. Unlike a traditional sofa, a rearrangeable sectional can be used for any event! Tables with drop leaves or removable leaves take up little room for family use and easily convert into larger surfaces when company arrives. Some have drawers underneath the tabletop, making it easy to store table games, coloring books and crayons or other items. Choose tables that have durable surfaces, or buy tablecloths and mats for protection. If your family or your guests enjoy playing billiards, table tennis or other table games, check out convertible dining tables. Some even transform into office desks or game tables. For the kids, you might want a miniature game table with a top that flips up for use as a chalkboard. These innovations are out there! So, take advantage. If there is any possibility that overnight guests will make use of the basement, consider purchasing furniture that does not take much space during the day but converts into a comfortable bed at night; there are plenty of choices. A few examples are Murphy beds, trundle beds, daybeds, hide-a-beds, convertible ottomans, and flip chairs. 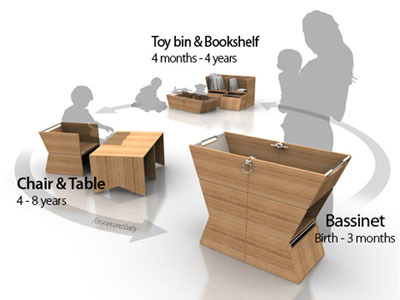 If you have any need for baby furniture, look into furniture that changes as your child grows. This type of furniture comes in handy for entertaining families because of the adaptations that are possible. For example, many cribs are designed to eventually become toddler beds, a daybed, play tables, or desks. Some bassinets convert to either a toy bin and bookshelf or a chair and table combination that fits children up to eight years old. Why buy two pieces of furniture when you only need one? Do you or your guests enjoy playing the piano? One company in Canada offers a study table or nightstand that has a digital piano built into it. With the lid closed, the top surface is smooth. Flip open one part of the top, and boom! there is the piano. The opened top section now serves as a music stand, and a set of earphones is provided for those who want to play music without disturbing others. The unit is lightweight and can be moved wherever you want. One of the newest lines of rearrangeable furniture is “Modos.” This changeable furniture system is made of boards joined together by uniquely styled connectors. It assembles without tools and can easily be disassembled for moving or storage. Most Modos furniture designs are offered as do-it-yourself projects that include construction plans and the connectors. You furnish the wood. This article mentions only a few of many options. Because of the wide variety of changeable furniture now available, it is easier than ever to use your basement for both family living and entertaining. Before buying, consider the possible uses of each piece of furniture. Check into the quality of construction and the types of materials used. If the furniture is on wheels, make sure the wheels are sturdy and that they won’t mar your basement floor. Careful shopping will make it possible for you, your family, and your guests to enjoy your purchases for years to come.